Diamonds are one of the best items in Minecraft. They are used to make amazing tools and armor and are a way to showcase your wealth. But how do you find diamonds in Minecraft and what is the best way to get them? First, it will take a bit of preparation! An iron or diamond pickaxe is required to mine diamonds. Iron is common in the game, so it is quite easy to make an iron pickaxe. You will need torches to light up your tunnels and for exploring caves. Food is important because mining will cause hunger over time. You will encounter mobs, so armor and a weapon are useful. A shovel is useful to clear dirt and gravel in your way. Sticks are important to make more torches as you mine coal. Optional: a water bucket is useful for turning lava into obsidian. Optional: fortune-enchanted pickaxes will increase the amount of diamonds you mine. PHOTO: Ideal inventory before going to get your first diamond ore.
Diamond ore is only found underground, between the “y-coordinates” of 1 to 15. The y-coordinate is the number of vertical blocks you are from the very bottom of the map. In simpler terms, this means that diamonds are found only in the bottom 15 vertical blocks of the map. You can see your current y-coordinate by pressing F3 on PC, or by opening an in-game map item. PHOTO: Example of an F3 screen on PC Minecraft. The red box shows the x, y, and z coordinates, with the “15” being my current y coordinate. Below this level, I will be able to find diamond ore. Begin digging underground and be careful not to dig straight down as you could easily die from a large fall or from landing in lava. It’s best to dig in a “staircase” method down so you can easily walk back up after you are done mining. 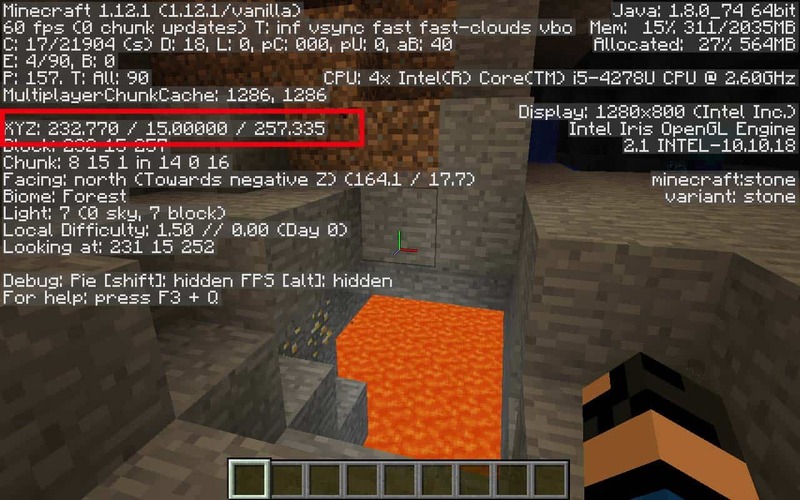 The best level for mining diamonds in Minecraft is 11 or 12. I have found these y coordinate levels to be the best for finding diamonds in Minecraft and avoiding annoying lava lakes. To find diamonds while mining, you have two main options: mining tunnels, or exploring caves. I recommend exploring all deep underground caves you encounter while mining as they will often have diamonds in them. Once you run out of caves to explore, or if you dug down and haven’t found a cave yet, you should mine tunnels at a y-coordinate of 11 or 12 as shown in the photo below. 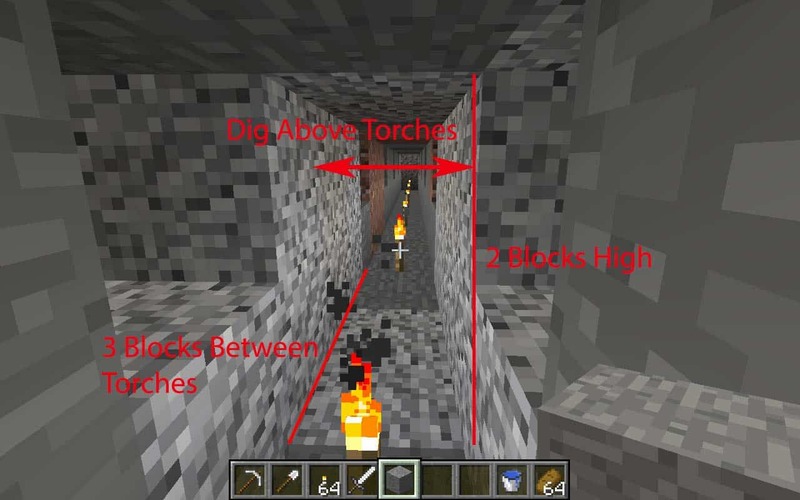 PHOTO: Efficient mining tunnels in Minecraft include one long 2×1 tunnel with torches placed evenly every 4 blocks. You can mine above the torches in both directions as far as you can go to search for ores. The fortune enchant on a pickaxe is the best way to increase the number of diamonds you are getting. This enchant will make it so 2, 3, or even 4 diamonds can drop from each ore you mine. Make sure you mine all the stone around any diamond ore you find. You never know if there might be one more ore close by that you missed. If you mine all the coal you find instead of skipping it, you can sometimes find diamonds behind the coal. This only works if you are deep enough underground for diamonds to appear.